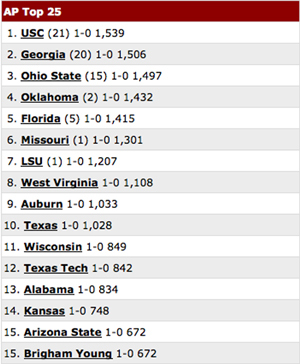 Saw the recent AP Poll for College Football. 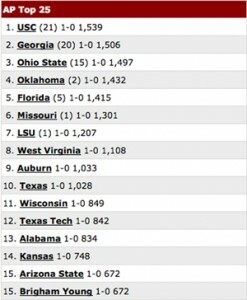 WVU is still at number eight. Good spot for them really. I watched most of their season opener against Villanova. The offense really clicked for most of the game. Pat White had 5 TDs…all in the air and none on the ground, probably something we will have to get use to seeing here this season. Despite a lousy start the defense played fairly well, forcing a couple turnovers that lead to points. Pat McAfee still has a solid leg. Other than the third quarter and a couple turnovers the defense got ran over by a I-AA school. Yikes. Noel Devine had next to nothing on the ground in the running game, which in all respect I kind of liked because this wasn’t the game to let him run for 200 yards. Also, loved some of the new video boards at Mountaineer Field. They looked good on TV and will come across even better once they are all finished. Eastern Carolina is up next this weekend. Boy am I ever nervous for that one.